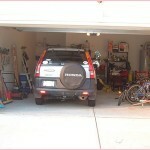 Get the most out of your garage. If you’re like many other homeowners, your garage probably gets used for a variety of different purposes: to park your car, work on your car, store tools and other items or the ever-popular “man cave”. No matter if you tend to use your garage for work or play – why not get the most out of it? Whether you have your friends over for a beer or your classic hot rod resides in the garage, there’s no reason not to have a nice-looking garage. Let’s face it – the garage floor gets grungy easily from oil drippings, spilled paint and tracked-in dirt, making it look like a busy mechanic’s garage after a while. 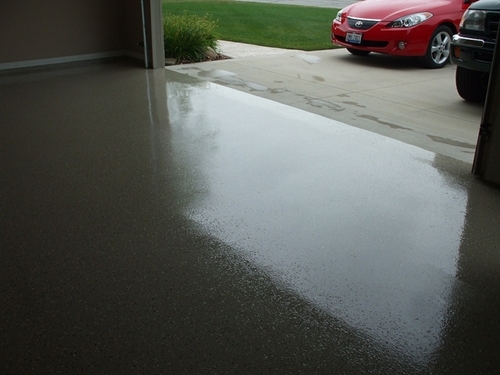 Coating the garage floor with epoxy is a super way to get a new garage floor. 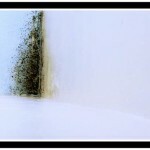 It’s waterproof, resistant to oil stains and can easily be wiped down to clean it if it does get dirty. Epoxy floor coatings for the garage come in a wide variety of colors and can be applied much like paint, allowing for you to not only protect your garage floor but beautify it at the same time. 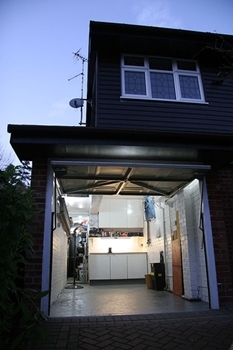 Most garages seem to rely on a single light in the middle of the ceiling or a fluorescent light fixture or two, which doesn’t make for the most inviting garage – and if it’s cold or hot outside, opening the garage door for additional light may not be the most attractive idea. While fluorescents are the “go-to” light fixture for the garage, there’s no reason why you can’t add other lighting as needed. For instance, you might run some rope lighting along the top of the wall below the ceiling to provide some additional ambient lighting, or install pendant lights over certain areas of the garage, allowing you to provide focused light for a given area of the garage. A tried-and-true decorating standby – a new coat of paint for the interior of the garage can add some pizzazz and open up even a cramped or dim garage. If you’ve applied an epoxy coating to the flooring already – choosing a paint color for the walls and ceiling that complements or contrasts with the floor color is a great touch. If you use your garage for working on cars or home improvement projects, safety is paramount to avoid dangerous slip-and-fall accidents and other problems. While concrete is a commonly-used garage flooring material, slipping on wet concrete is always a potential danger especially during inclement weather. 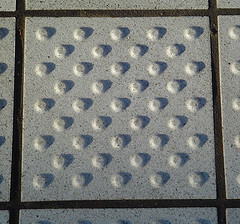 Fortunately, there are a variety of non-slip surface options available including floor coatings, mats and tiles that can be applied to your existing concrete flooring. 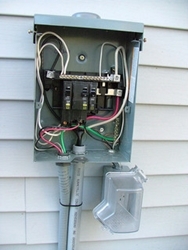 If you’re using power tools or other electrical machinery that draws a good deal of power, always make sure that you have GFCI (ground fault circuit interruptor) breakers installed in the garage. While a standard circuit breaker will cut the power if you draw more than the wiring can handle, a GFCI will prevent you from being electrocuted in the event you come into contact with water while using machinery that is drawing current. 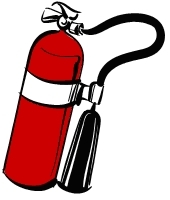 If you have gasoline, anti-freeze or other hazardous materials in your garage and you have small children or pets in your home, always make sure these items are stored in a securely locked cabinet – antifreeze in particular is dangerous because it has a sweet taste that often attracts animals and small children. 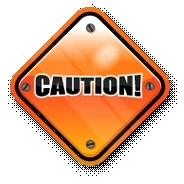 Any potentially hazardous power tools (circular saws, drills, etc.) should be secured as well. 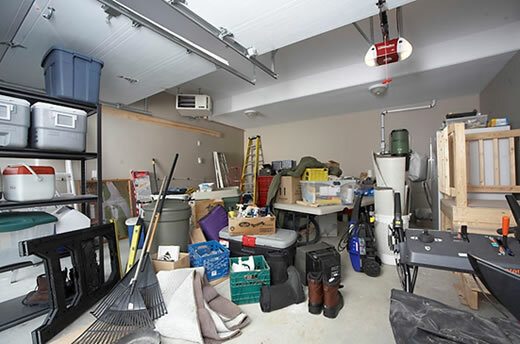 Keeping your garage free of clutter is easier said than done, but once you’ve figured out a great scheme for organizing everything, it becomes that much easier to keep it that way. 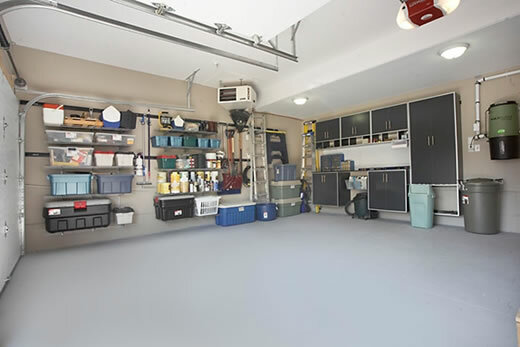 When deciding where to put various items in the garage – make sure you prioritize the spaces you can easily reach and use them for the most frequently-used items first. If you keep your garbage and recycling bins in the garage until pick-up day, place them by the garage door, for instance. 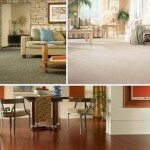 Designate a specific area for each set of items (e.g. camping supplies go here, paint goes there, etc.) and put everything in that area if possible so you’re not hunting through the entire garage for a missing piece of equipment. 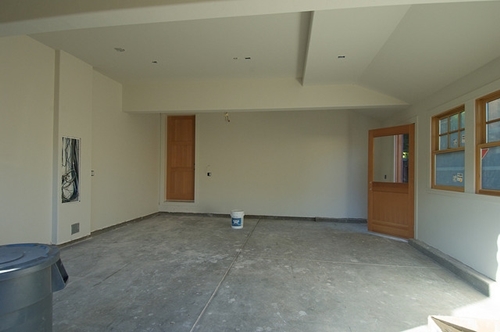 Especially if you park the car in the garage, you’ll want to take advantage of all the available space you possibly can including the ceiling and walls. For the ceiling, look into installing hanging storage units, while pegboard is great for getting the most out of your wall space. 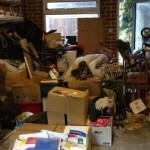 Wow – The organized version of the above shown garage. 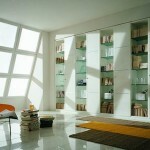 Photo by Rubbermaid Products. 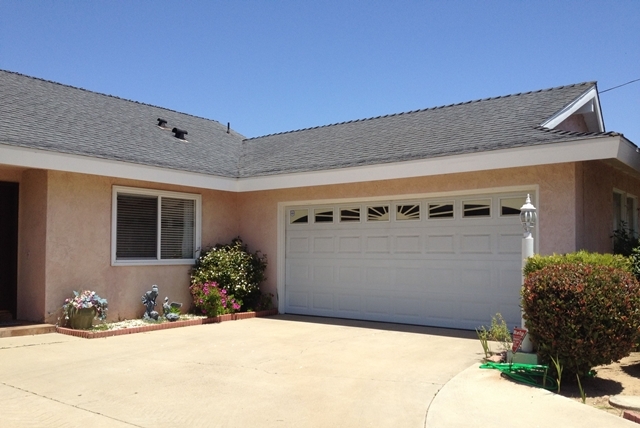 Justin Krutz writes about a variety of home improvement-related topics for GSM Garage Doors, an Escondido garage door service company. 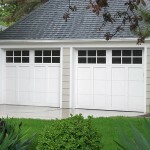 Electric Garage Doors Are One Of Life’s Little Luxuries – Look After Them! Apartment Apathy? Wake Up And Get Fabulous!